Safety of Pretarsal Botulinum Toxin for Blepharospasm Associated Pseudo-apraxia: Is Ptosis a Real Concern? Pseudo-apraxia of eyelid opening can cause severe visual debilitation. In the current study, the safety (e.g., blepharoptosis incidence) of pretarsal botulinum toxin type A injections for the treatment of pseudo-apraxia of eyelid opening was evaluated. A 62-month retrospective chart review was performed. Sixty-one patients, 13 from John R Burroughs M.D., P.C., 48 from Plastic Eye Surgery Associates, PLLC, received botulinum toxin type A injection treatments to address either isolated pseudo-apraxia of eyelid opening (6 patients) or pseudo-apraxia of eyelid opening combined with spastic benign essential blepharospasm (55 patients). A total of 634 injection treatments, with an average of 5.2 units (range 1.25-15 units) of botulinum toxin type A per eyelid, were administered to the upper pretarsal orbicularis. All patients exhibited improvement of their pseudo-apraxia of eyelid opening. Blepharoptosis was seen in only 6/634 (0.95%) injection treatments, and there were no incidences of diplopia, suggesting that pretarsal orbicularis oculi Botulinum toxin type A injections are a safe and effective treatment for pseudo-apraxia of eyelid opening. Benign Essential Blepharospasm (BEB), an incompletely understood disorder characterized by the involuntary and often episodic contraction of periocular muscles, causes the eyelids to spontaneously close. Untreated, BEB often results in functional legal blindness . There are two basic variants of BEB: 1) spastic BEB (sBEB) includes involvement of the preseptal and orbital orbicularis, inducing forceful clenching closure of the eyelids; and 2) pseudo-apraxic BEB (paBEB) which involves the pretarsal orbicularis oculi (PTO), the portion of the orbicularis responsible for normal eyelid blinking. The clinical appearance of paBEB is an eyelid that simply will not open. There is no visible forceful clenching of the eyes, and thus initially this was felt to be a form of apraxia of eyelid opening, or a dysfunction of the neuronal signal to the levator palpebrae superioris muscle. However, close inspection and neuromuscular studies reveal that patients with paBEB suffer continued contraction of the PTO, which is stronger than the levator palbeprae superioris, and so the eyelids stay closed, creating a pseudo-apraxia of eyelid opening [2-5]. Botulinum toxin (BoTx) injections have been shown to be highly effective and the treatment of choice for most persons afflicted with BEB [1, 2]. However, since the causes of sBEB and paBEB differ, it should not be surprising that the most effective locations and doses of BoTx injections should differ as well. In particular, we have felt that injections across the PTO are most efficacious for patients with paBEB; unfortunately, some have suggested that central upper eyelid injections over the PTO should be avoided due to the risk of inducing a weakness in the levator palpebrae superioris muscle and subsequent blepharoptosis, but the magnitude of that risk has not been well documented [2, 4, 6-11]. Many BEB patients have been referred to the authors' practices as "non-responders" to BoTx injections, and the majority of these patients have turned out to have either pure paBEB or a combination of paBEB and sBEB. A 62-month retrospective chart review of two oculoplastic practices, John R Burroughs M.D., P.C. (JRB) and Plastic Eye Surgery Associates, PLLC (CNSS), was conducted searching for patients with paBEB managed with central eyelid PTO BoTx injections in order to quantify the incidence of post-injection blepharoptosis. Figure 1. Centro-lateral injection. Note very superficial supra-orbicularis plane placement of the 32-gauge needle and creation of wheal to avoid bruising and over-dissemination. Arrows show additional pretarsal lateral, central, centro-medial, and medial injection sites. One hundred units of onabotulinumtoxinA (Allergan, Inc., Irvine, CA, USA) were re-constituted either with 2.5 cc (JRB) or 1 cc (CNSS) of preserved normal saline and injected using a skin pinch technique with a 30 or 32 gauge needle and a 1 cc syringe. No pretreatment with anesthetic or cryoanalgesia was performed . 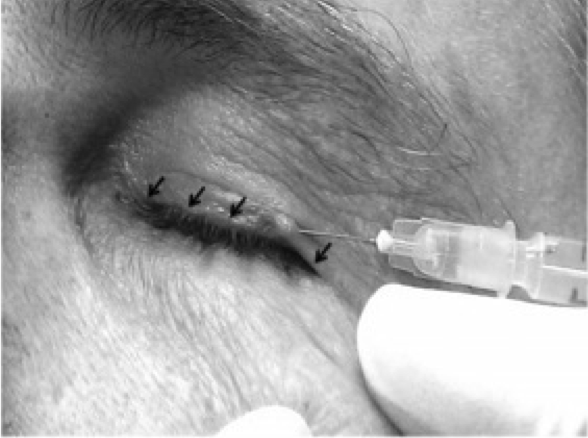 The PTO injections were placed just below the epidermis within two millimeters of the eyelash line to minimize the risk of hitting the superior marginal arcade (Fig 1). The PTO BoTx injection number and doses were individualized and altered based upon the injector's observations and the patient's reported results. Typical areas of injection included medial, centro-medial, central, centro-lateral, and lateral portions of the PTO (Fig 1). JRB injected up to five areas in the pretarsal area, generally starting at only three (medial, central, and lateral), whereas CNSS generally performed only two PTO BoTx injections (medial and lateral), but would broaden the area of treatment across the entire eyelid by advancing the needle under the skin before injecting. All patients had post-treatment evaluations either by office-visit or telephone evaluation assessing whether or not symptoms improved and if any complications (e.g. blepharoptosis) occurred. Billing records were searched for patients billed for chemodenervation (CPT code 64612 for ICD.9 code 333.81), and charts were then manually examined to include only patients being treated for pseudo-apraxia of eyelid opening with PTO BoTx injections. Informed consent was obtained for chart study from each of the subjects in accordance with Health Insurance Portability and Accountability Act regulations, and the principles outlined in the Declaration of Helsinki were followed. The retrospective chart review revealed 61 patients who received 634 BTX treatments over a 62-month period. Patients received an average of 5.2 units (range 1.25-15 units) of PTO BTX injected per eyelid in divided doses, depending on the observed and subjective severity of the paBEB, to the medial, centro-medial, central, centro-lateral, and lateral portions of the PTO. Every study patient described significant improvement of the paBEB symptoms following the PTO BoTx injections. Overall, in these 61 patients with 634 treatments over five years, there were only six incidences (0.95%) of blepharoptosis, each in a different patient. These six patients who developed blepharoptosis each had received a dose (range 2.5-7.5) within the average PTO BoTx range. One episode of new-onset blepharoptosis occurred in a patient who developed significant pretarsal ecchymosis. The blepharoptosis resolved after three weeks and was improved before spontaneous resolution with 0.1% brimonidine eye drops (Allergan, Inc, Irvine CA, USA). Similarly, another patient, who was on clopidrogel bisulfate and aspirin, developed a large hematoma with presumed toxin spread. Another case was attributed to a sub-brow injection used to elevate the eyebrow, which developed a hematoma and presumed toxin spread. Of the remaining 3 patients, pre-existing blepharoptosis was exacerbated by the toxin injections. In all three of these cases, after surgical repair of the pre-existing degree of blepharoptosis, there were no further episodes of BoTx induced blepharoptosis. The clinical descriptions and management of paBEB in the medical literature remains somewhat unclear with concerns that central upper eyelid injections significantly increase the risk of blepharoptosis . Few studies actually describe BoTx for paBEB [4, 13-16]. Georgescu et al. and Newman et al. suggest that many BoTx failures for sBEB are attributable to paBEB being overlooked or incompletely addressed [2, 17]. Cakmur et al. reported increased success for both response rate and duration of reduced spasm effect when PTO BoTx was placed for “blepharospasm and hemifacial spasm patients” . Herein, we provide the largest specific BoTx treatment series for paBEB and found only a 0.95% incidence of induced blepharoptosis. We attribute this low blepharoptosis risk to the described PTO BoTx injection technique of placement just below the skin in the supraorbicularis plane in the safety zone between the superior marginal arcade and the eyelash line. Krack and Marion reported when obobotulinumtoxinA (Porton Products, UK) was injected into the upper eyelids, there was improvement in all 32 of their “focal eyelid dystonia” patients with no incidence of blepharoptosis . Similarly, Defazio et al. had improvement in 8/10 “isolated So-Called Apraxia of Eyelid Opening” patients with a no incidence of blepharoptosis when BoTx was injected to the PTO . Liao and Woodward advocate PTO BoTx injections for all sBEB patients, regardless of presence of paBEB, and noted only 2 cases of blepharoptosis in 23 patients receiving 257 injections (0.17%) over ten years . Huang et al. report that there was a 1% incidence of blepharoptosis encountered for 88 patients receiving a total of 300 injections to the central upper eyelid and/or central eyebrow for blepharospasm (176 procedures), hemifacial spasm (40 procedures), facial nerve disorders (nine procedures), and facial rhytides/eyebrow ptosis (75 procedures) . These low reported incidences of blepharoptosis seen following PTO BoTx injections compare very favorably to the rate of blepharoptosis of 1.8% in a large meta-analysis by Brin et al. of cosmetic BoTx for facial lines . When cardiovascular disease risk is minimal, we recommend discontinuing blood-thinning agents such as aspirin for at least several days before injections to lessen the chance for ecchymosis, which could cause unwanted wider dissemination of the BoTx. However, we routinely inject patients taking aspirin or other anticoagulants when needed. PTO BoTx injections were found to be generally effective for paBEB with a low risk for blepharoptosis. Despite the limitations of a retrospective review, our study provided the largest series of PTO BoTx injections used in the management of paBEB demonstrating a low incidence (< 1%) of temporary blepharoptosis. Furthermore, managing paBEB from a medical approach with PTO BoTx may be able to delay potentially more risky surgical intervention (e.g., frontalis suspension, myectomy) not readily available or desired by patients in areas lacking subspecialty oculofacial plastic surgeons. Patients with paBEB and pre-existent blepharoptosis, should consider having any medically necessary blepharoptosis surgically corrected, and advised that PTO BoTx placement may worsen their pre-existent blepharoptosis. John D. McCann, M.D., Ph.D.: Ongoing consultant/honoraria fees from Allergan; otherwise no proprietary interests Received no support for this study. James Hsueh: Employed by John R Burroughs M.D., P.C. “The authors declare no other conflicts of interest”. Portions of this study were presented at the American Society of Ophthalmic Plastic and Reconstructive Surgery 2012 meeting, Tuscon, AZ. A portion of this study was discussed in a letter to the editor of Ophthalmic Plastic Reconstructive Surgery Journal (2015, In Press). Newman SA, Slavin M, Phillips L. Apraxia of eyelid opening a cause of botulinum failure. Paper presented at: The North American Neuro-Ophthalmology Society; 1988; Crested Butte, Colorado. Liao J, Woodward JA. The incidence of ptosis in central pretarsal botulinum toxin injection for benign essential blepharospasm. Poster presented at: American Society of Ophthalmic Plastic and Reconstructive Surgery Fall Scientific Symposium; 2011; Orlando, Florida.